When I saw this Facebook post of Sarah Helton celebrating her pregnancy with this fetal pumpkin, I thought it was fantastic. She made me think that you could help share our pro-woman, pro-life message by simply (or elaborately) decorating pumpkins! What would you like to share? A silhouette of a pregnant woman? 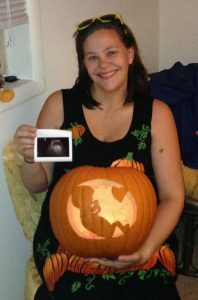 Or a view of the unborn child like Sarah created? FFL’s beautiful interpretation of the woman’s feminist symbol and name? FFL’s message that “Peace Begins in the WombTM” or “coEXISTTM“? Here’s your chance to shine a light on life in a new way. – You can paint, affix items, and/or carve your pumpkin. – If carved, you are encouraged to illuminate it from within. – If a minor, parents must submit image with his or her permission. Please when carving, adult supervision recommended. – Identify yourself or your child if in the photo. – Your submission infers your agreement to abide by our simple rules and agree that FFL has the right to publish the image. Let us know your full name or if a minor your parents can submit a first name and initial. You can decide if you want your town and state to be identified. – Deadline for submission Midnight, October 23. 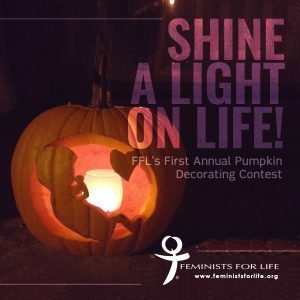 Feminists for Life will post winners leading up to Halloween.